The frozen kingdom needs saving!! With Olaf on your side it will be very easy. Birthday is the most exciting day for kids specially. Imagine her waking up in the FROZEN KINGDOM . Get your venue (house/party hall) decorated with lots of blue, white and purple balloons, standees of Olaf, Elsa and Anna and celebrate your special occasion in the best way. The frozen kingdom needs saving!! With Olaf on your side it will be very easy. Birthday is the most exciting day for kids specially. Imagine her waking up in the FROZEN KINGDOM . Get your venue (house/party hall) decorated with lots of blue, white and purple balloons, standees of Olaf, Elsa and Anna and celebrate your special occasion in the best way. Make your booking for the Frozen Elsa princess theme decoration and lift the curse from kingdom. Our decoration team would coordinate with you for your theme after booking. 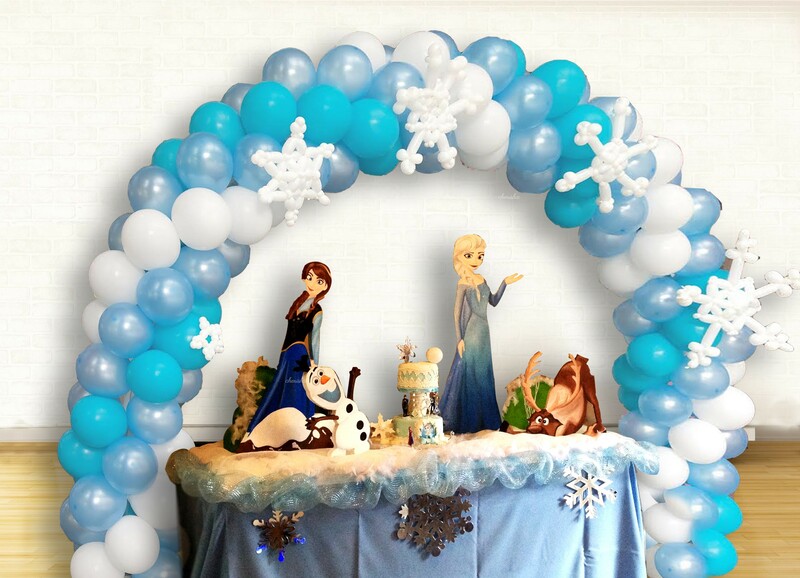 Your decoration would have a balloon arch made in the theme of frozen specially crafted by a balloon modelling artist. (350 balloons tastefully decorated and colour coordinated to match your theme). 3 snowflakes and 3 ft standees of characters from frozen..
You can add special frozen backdrops of paper rosette for your photo-time. The whole set up would take two hours. You can surprise your kin when she returns from school. Add interesting customisations that go with your theme like backdrops, themed party favours or Game coordinators, puppeteers, photo props ets.